Intended to be a guide to help those who are not spiritually inclined to have a closer walk with God this book, Living Closer to God, falls short of the mark. Living Close to God starts out by explaining that some people are not as spiritually inclined as others. The author then uses the example of his completely illiterate grandfather to prove his point that you do not need to be highly educated to have a deep personal relationship with God. While I do not disagree with this belief I still would have liked to have been given some examples of his grandfather's walk with the Lord instead of just being told that he had a good one. 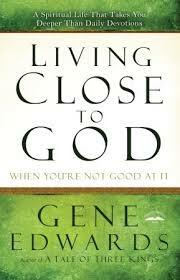 I also would like to know why Gene Edwards, the author of this book, believes he is spiritually inept. Gene Edwards seems to focus on how he feels about his spiritual aptitude instead of the reality of it. You cannot and should not gauge your spiritual success by how you feel at any given moment. Christianity is not a one size fits all kinda thing. It is about a relationship and the neat thing about relationships is that each one is different because each person is unique. The author seems to only focus on the 23rd Psalm and believes that only some of the scriptures can be used by God to speak directly to a person. I am one of those strange people who believes "all scripture is given by inspiration of God." I also believe that God can use any of His scriptures to speak to a person including the genealogies if He chooses. The author rewrites the 23rd Psalm and instructs the reader to focus on his version of the scripture rather than actually focusing on the Word of God. Overall, I did not appreciate the tone of this book nor its methodology. Instead of breaking this book up into nineteen chapters and six parts each one seeming to reiterate what was stated previously...over and over again. The author could have condensed the book's contents into a step by step pamphlet to hand out on Sunday mornings. While I do agree with the author that we should keep our speech plain so that all can understand, I do not believe in totally disrespecting your reader by treating them as though they were a complete dolt. So to sum up, I would not recommend this book on several factors. The authors tendency to rewrite scripture and encouraging his readers meditate on his version rather than on the actual word of God. His tendency to talk down to his readers. And the fact that the content of this book was seriously lacking. Look, we all from time to time can benefit from a little help with our spiritual walk but I do not believe that any of us is more spiritually inclined than another. None of us has the natural ability to stay close to God. It is God in us that enables us to do so. It is an even playing field. We are told in scripture that if we seek Him with our whole heart we will find Him, that He is a rewarder of them that diligently seek Him and if any of us lack wisdom we can ask God and He will give it to us all equally. Please rank my book review: ranking tool can be found at the top of this post. Thank you!